Original Mezet Speck Bacon Sarntal L. Moser approx. 250 gr. The Mezet bacon disposes of a little bit more white bacon interest and is milder therefore and more delicately in the taste. Pork halves form the raw material without bone. Halves are disassembled and boned. The cutting follows after antique tradition. A confidential tip for true bacon experts. Buy now this product together with Belly Bacon Smoked Pancetta Senfter approx. 300 gr. ready for shipment: in ca. 5 days Belly Bacon Smoked Pancetta Senfter approx. 300 gr. Buy now this product together with House Speck Bacon Steiner 1/2 flitch approx. 2,5 kg. House Speck Bacon Steiner 1/2 flitch approx. 2,5 kg. ready for shipment: in ca. 5 days House Speck Bacon Steiner 1/2 flitch approx. 2,5 kg. South Tyrolean venison raw ham Bernardi K. approx. 350 gr. 20,35 EUR / 58,14 €/kg. Ham bacon 6 months ripened 1/2 vac. appr. 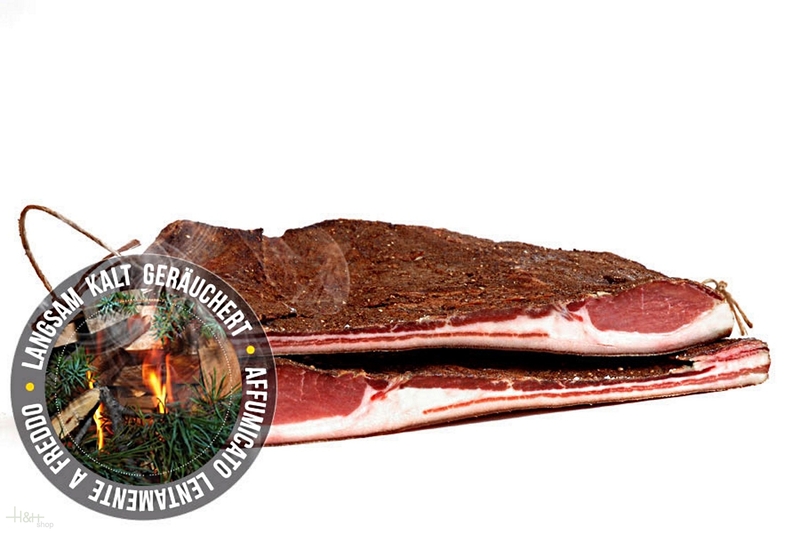 2.25 kg - Kofler Speck 31,25 EUR / 13,89 €/kg. Belly Bacon Steiner piece approx. 1 kg. 16,75 EUR / 16,75 €/kg. Speck Premium without rind 1/2 ca. 1,9 kg. - Ager 53,25 EUR / 28,03 €/kg. Square Speck Premium 1/4 appr. 450 gr. - Ager 15,70 EUR / 34,89 €/kg. Ham bacon with herbs 6 mo. ripened 1/8 core piece vac. appr. 450 gr. - Kofler Speck 12,35 EUR / 2,74 €/100 gr. Speck Premium 1/4 ca. 1 kg. - Ager - Tiroler Schmankerl 26,45 EUR / 26,45 €/kg. Kräuter-Blütenkaiser ca. 400 gr. - Mair Spezialitäten 17,45 EUR / 43,63 €/kg.